That certain style that combines chic extravagance with toned down decor is exactly what Jacques Grange represents in the design world. The acclaimed French designer has acquired such clients as Yves Saint Laurent, Aerin Lauder, Princess Caroline of Monaco and Francis Ford Coppola - just to name a few. Grange was born in 1944 in a town called Saint-Amand-Montrond, located in the center of France. Grange took a strong interest in drawing as a child and frequently took classes in Paris. He recalls visitors such as Marc Chagall and Le Corbusier popping in. 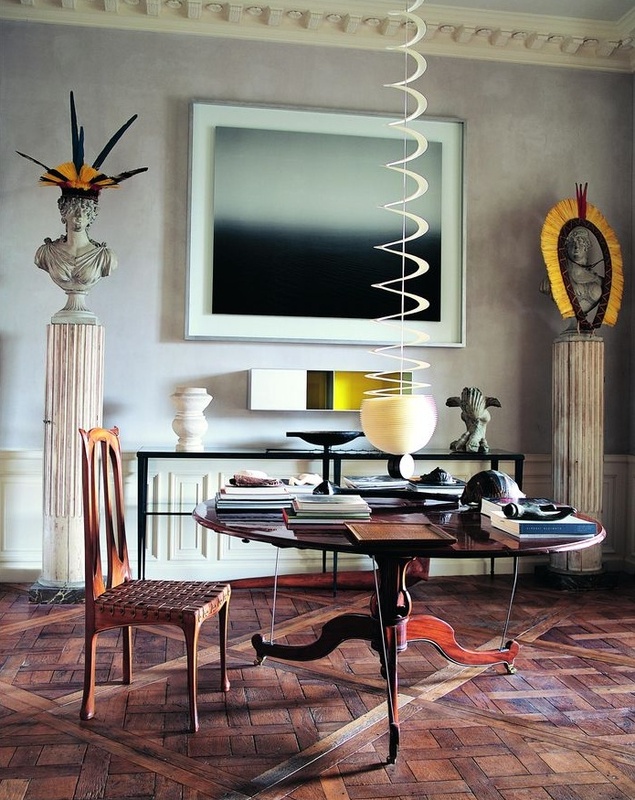 After completing his schooling at the école Boulle and the école Camondo, Grange was hired as a draftsmen in 1968 at the interior design offices of Didier Aaron. Aaron encouraged Grange to go out and supervise his own projects early on in his career. It wasn't until 1971 that Grange met Yves Saint Laurent. Grange famously designed Yves Saint Laurent's villa in Marrakech and his Chateau Gabriel near Normandy. The two became close friends and Grange describes Laurent as his most enriching client. Chateau Gabriel was decorated in theme with the idea of recreating a Belle Epoque film set. It was lavish and filled with objects that were hunted by Grange and Laurent's partner, Pierre Berge. The living room walls were painted to resemble Claude Monet's Water Lilies. With a different theme in every room, the Chateau feels like you are walking through a storybook. Francis Ford Coppola's 19th century Palazzo Margherita is located in his hometown of Bernalda in Southern Italy. Coppola enlisted Grange to turn the Palazzo into a grand hotel inspired by a combination of the Belle Epoque and a comforting family home. Grange explained the project as a restoration project but with a fresh summer feeling. Every member of the family was able to design their own room. Sofia Coppola decided to go with a feminine suite adding wicker touches and pink accents. Roman, Coppola's son, requested Arts and Crafts details. Coppola's own suite has Tunisian-style painted ceilings and a zigzag tiled floor. In 1990 Jacques Grange was approached by the stepdaughter of famed novelist Colette, who passed away in 1954. She explained to Grange that Colette's apartment was meant for him. At first he didn't have the means to buy it so he rented it until 2008, when he decided to purchase the apartment overlooking the lush gardens of the Palais Royal in Paris. Since then Grange has made it his own, redecorating all five rooms. The rooms are filled with collected items from the 18th and 19th century and feels like the home of a collector. Grange describes his home: "It's now a place to display and balance in harmony the things I love." Grange has been able to change his taste through the years and adapt with the times. Unlike many designers Grange was classically trained, and has built his style up from this foundation.